and draw your attention to its performances. The theatre deals with a special form of art of puppetry. 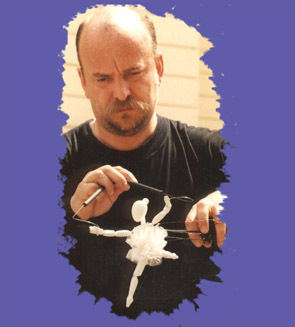 The founder and owner of the theatre, András Lénárt, made experiments with creating a new type of puppet with a unique construction that can be found in no other kind of puppets. Although the size of these puppets is very small, in there movements they are rather lively and natural. The shows are played on a tiny stage. The audience therefore has to sit close to it in order to get a perfect view of the performance. The movement technique of the performer can be compared to the "micro magic" in a magic show. As the size of the puppets and the stage is rather small the shows are performed in two sorts of forms: one of them is when the show is played outside in order to have a continuously changing audience and the other form is when the show is performed inside so that to focus on the intimacy of the show. Therefore the length of the shows is quite short but they can be repeated many times to attract more people. Since the theatre is "micro" the equipment can be transported and assemble together easily. The theatre has performed in many countries in Europe: in Romania, Serbia, Croatia, Slovenia, Austria, Czech Republic, Poland, Germany, Italy, Spain, France, Belgium, Holland a Ireland, Sweden, US, Canada, Korea, China, Hong Kong, Brasilia Japan has won many awards and praise of different audiences.